Miami Do we need any further validation that Bill Parcells can turn a franchise around? The 2007 Miami Dolphins finished the regular season with one victory. The '08 version of the Dolphins are headed into week 12 and they have 600% more wins than they did just a year ago. 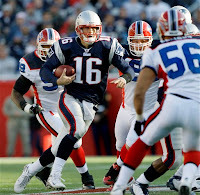 Thanks to the late offseason addition of former Jet quarterback turned Jet castoff, Chad Pennington, the Dolphins are 6-4 and staring down the barrel of the New England Patriots. Despite their struggles against Oakland last weekend, the Dolphins have beaten the Pats in Foxboro, the Broncos in Denver, and sit 2-1 in their conference with (3) conference games remaining. Former first round draft pick, Ronnie Brown, is finally healthy and paired with Ricky Williams the duo has rushed for over 1,000 yards in their first ten games. 3rd year receiver Greg Camarillo and the darling of Columbus, Ohio, Ted Ginn, have combined for 87 receptions and 1,046 yards. Their defense led by NFL sacks leader (13.5) and resident big mouth, Joey Porter, allow just 313 ypg. That same defense allows the tenth fewest points per game in the league at 19.7, the same defense that dumped future Hall of Famer, Jason Taylor in the offseason. With a win against New England, the Dolphins would be sitting in line for a shot at the Wild Card. Indianapolis "Just when I thought I was out, you pull me back in" When they were 1-2, they then proceeded to win two straight games and pull back to 3-2. The Colts would follow up their two wins with two more losses and again we would put the Colts on the brink. Peyton and Co. then ripped off three straight wins against New England, Pittsburgh, and Houston to improve to 6-4. To say they've been a roller coaster would be an understatement. However, if we've learned anything from Tony Dungy and Archie's son, they aren't out until their out. Their next four games are against four teams with losing records, including back-2-back games against Cincinnati and Detroit, who have a combined 1 victory. With Jacksonville and Tennessee in weeks 16 & 17, the Colts could still finish off 10-6 which would most likely be good enough for a playoff birth. So much for the Colts being over and out. Baltimore I thought I knew something about the Ravens, then their top ranked rushing defense gave up 207 points to the Giants last Sunday. The rookie quarterback, Joe Flacco added two more interceptions to his total (9) and was sacked for the 18th time this season. On the other hand, since their three game slide in early October, this was their first slip up. The Ravens 3-1 record in their division keeps them alive in the playoff hunt. A divisional game in week 14 against the Steelers in Baltimore will most likely determine who wins the AFC North. Despite Flacco's recent play, his rookie season has got off to a great start. He's completed at least twelve passes in every start and hasn't thrown for less than 129 yards in any game. For a team who has struggled as bad offensively over the past several years as the Ravens have, Joe Flacco has been a welcomed addition. At 6-4, winning the division might be the only way the Ravens get in. Games against Philadelphia, Washington, Dallas, Jacksonville remaining don't give Ravens fans much promise. Denver Question: How does a team that allows 143 yards rushing per game and boasts the 29th best defense in the entire league, have a 2-game lead in their division? Answer: Welcome to the AFC West. The Broncos got off to a great start winning four of their first five games. Then they got beat down by three probable playoff teams before eeking out wins in Cleveland and Atlanta. What do I think of the Broncos? No team, you got it, NO TEAM, with a defense this bad will win much more than a trip to the postseason, thats where it ends. Two things win Super Bowls, a solid defense and a quality running game. Their defense speaks for itself and their rushing attack has only had one hundred yard game this season. Fortunately for the Broncos, they have three divisional games remaining and two of them are at Mile High. Congrats, Norv Turner is coaching one of the most talented teams in the NFL (San Diego) and their in your division, and of course they were going to fall off a bit. New England Perhaps I should tell you to go back to week 2 of the NFL season when I told you that the Patriots wouldn't trip up as bad as people thought. However, what I and the rest of you didn't see coming was Matt Cassel turning into a $40 million dollar free agent. The Patriots are without an injured all world quarterback, multiple talented running backs, a pro bowl safety and linebacker, and still their a game back in the division. They played about as bad a half of football a team can play last week and were down 24-6 before taking the Jets to overtime. They lost current Eagle cornerback, Asante Samuel to free agency and replaced him with ummmmmmm yea, exactly. Is it so crazy to think, that a year after storming through the NFL regular season with a 16-0 record, the Patriots are trying to prove that they can take everything away and still get to the dance? Returning to the backup quarterback, Matt Cassel, the guy has thrown only 7 interceptions in what should be considered as his rookie year. He is the only NFL quarterback in the history, let me repeat, in the HISTORY, of the NFL that has thrown for over 400 yards and ran for over 60 in one game. Not Steve Young, Mike Vick, or Randall Cunningham, only Matt Cassel. One concern, and I'll mention it because it will come into play, Cassel can't connect on the deep ball consistently. Other than that, this team will play their biggest game of the season this next week in Miami. A win in Miami coupled with the Jets eventual loss in Tennessee will put the Patriots back atop the AFC East. Washington Their four game winning streak at the end of September seems a long ways away. They've dropped three of their last five games and if not for their wins against Cleveland and Detroit, they'd be hovering under .500. With the play of teams like Tampa Bay and Carolina it looks as if our previous forgone conclusion that three NFC East teams will go back to the playoffs may not be accurate, for Washington this is alarming. The Skins have an impact running back who needs to get healthy, his 1063 yards on the season is good for second among the NFL running backs. When healthy, Portis is one of the games best backs and has the ability to carry the this team toward the playoffs. First year head coach, Jim Zorn, has acclimated the young quarterback, Jason Campbell, to the West Coast offense. The 'Skins have 3 of their 6 remaining games against sub .500 opponents, but their real test will be in week 16 against Philadelphia, a must win. Dallas A 3-0 start, all the talent in the world, and yet they sit at 6-4. Their pro bowl quarterback sat for a month with a broken finger, the entire secondary was decimated, and their rookie phenom Felix Jones had a partially torn hamstring. How did the Cowboys respond? By trading future draft picks for another malcontent receiver. Not a shocker however, this is the type of thing they do in Big D. When the Cowboys won in Washington this past weekend a couple of things were proven. For starters, they are going to become a running team whether they like it or not. The broken finger of Romo makes him limited, it's obvious, but that may be a better thing than we thought. Passes over the middle, draws, dump off passes into the flat, and yes the occasional haul over the middle for fifteen to twenty. Until he's 100%, this is what you get from Tony Romo. Secondly, Marion Barber is the key to this offense and I'm glad Jason Garett gets it now. 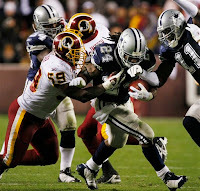 The Cowboy running back is the most powerful rusher this side of Brandon Jacobs in the NFL. He finds the end zone, the first down, and the open space in the defense. The Cowboys got him out toward the sideline in the first half, tired the defense and then fed them often up the middle. Defenses fear Romo's mobility and therefore cannot throw eight players, with ears pinned back, in the box. There final four games of the season are against the Steelers, Giants, Ravens, and Eagles, no slouches, if your getting in, your going to have to earn it. Atlanta Matt Ryan and Michal Turner, they are the corner pieces to this puzzle and the Falcons go as far as they go. They don't have an easy game left on their schedule till they get the Rams at home in the final week. Games @ San Diego, @ New Orleans, and @ Minnesota won't be easy for the Falcons and if their looking to get in the playoffs, they'll have to win at least one of those games. This is the readers digest version of Atlanta, they are very good at home 4-1, they've commanded games, they've won games down the stretch, and they've lost close games. This team can pretty much handle everything, and one would hope after living through everything this franchise has been over in recent history. The Falcons will go as far as Turner, Norwood, and the Falcon defense take them.